Very small (1- to 5-gallon) planted enclosures are lots of fun as relatively inexpensive and easy-to-set-up living displays, but illuminating them can present special challenges. 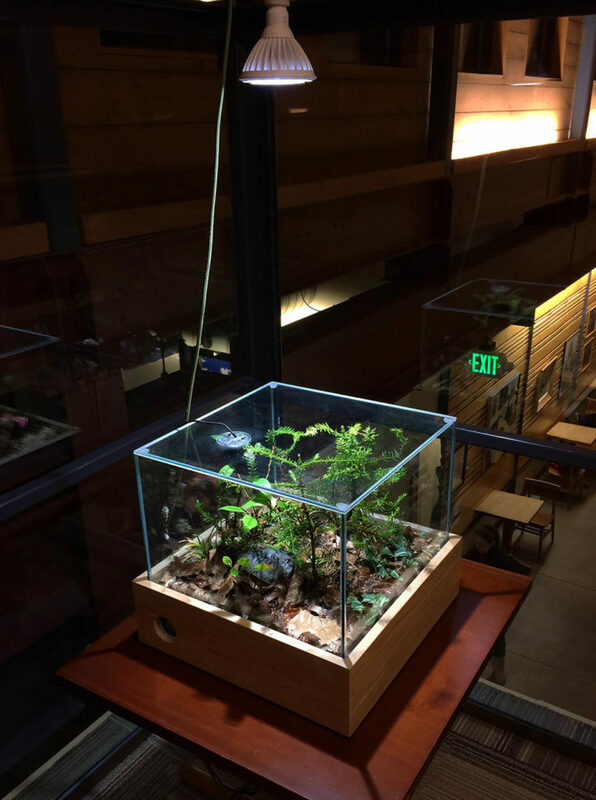 While the bracket assemblies supplied with nano aquarium lights can provide a secure clamp mount at the top of the glass rim, they might not work at all with a covered tank, and they might not hold very well on a round vase or bowl. Suspending the light as a pendant above the tank can be a more secure option and has the added benefit of adjustable vertical positioning for varied lighting intensities. 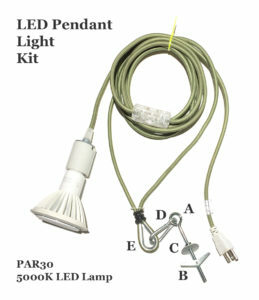 Most aquarium hobbyists have used “brooder lamp” clamp lights as temporary lighting with screw-in LEDs or compact fluorescent bulbs, either by clamping nearby or hanging above the display. These portable sockets cost just a few dollars, but most are of chintzy construction that is neither durable nor visually appealing. Clamp light cords are not strong enough to hold the weight of the socket with lamp, so the light must be suspended instead by clamping to a chain or cable, further cluttering the display area. 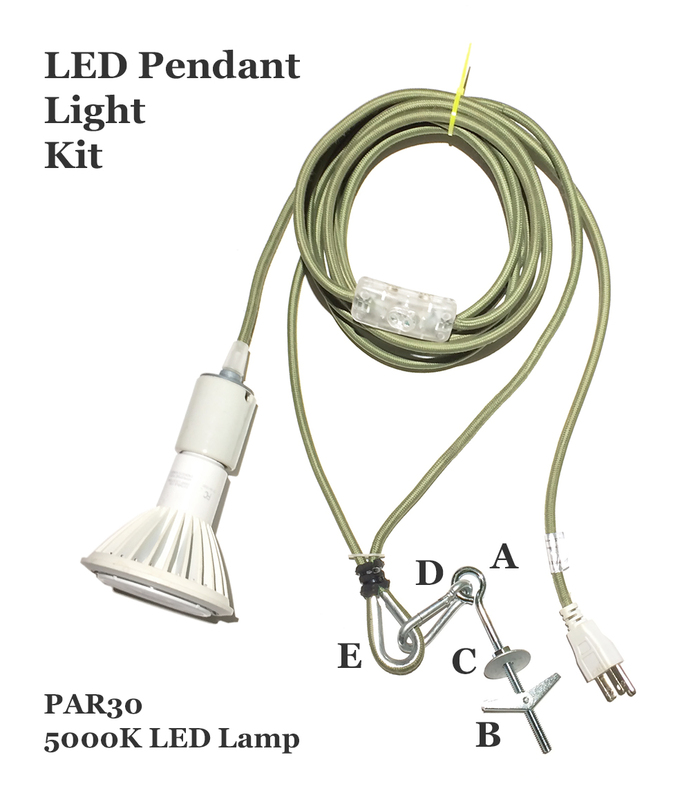 Used in combination with PAR LED spotlight lamps, the Color Cord Company Plug-In Pendant Light Cord Set offers a sturdy, good-looking, adaptable pendant lighting solution for nano aquariums, small terrariums, and similar planted displays. These fixtures are offered with a few different socket possibilities—the Porcelain socket is my favorite—as well as cloth covering in dozens of different colors and patterns. In most interior spaces the 15′ cord with switch will easily reach from the socket to the ceiling and back down to a nearby wall outlet. I have employed just a few additional pieces of hardware (see above) to hang this pendant with an LED light. A 3/16″ eye bolt (A) is secured through the ceiling drywall with a toggle nut (B). A washer (C) covers the ragged 1/2″ hole made in the ceiling for passage of the toggle nut and is clamped down tight with a plain 3/16″ nut. If a ceiling joist can be located in a suitable spot, a simple sturdy screw eye can be used in place of the eye bolt with toggle nut. A steel spring snap (D) joins the cord and the eye bolt. Although not entirely necessary, I have also attached a rope thimble (E) as an extra secure way to hang the cloth-wrapped cord. Use an outlet timer to control the photoperiod timing and duration. You can probably find suitable PAR LEDs at your local hardware store. 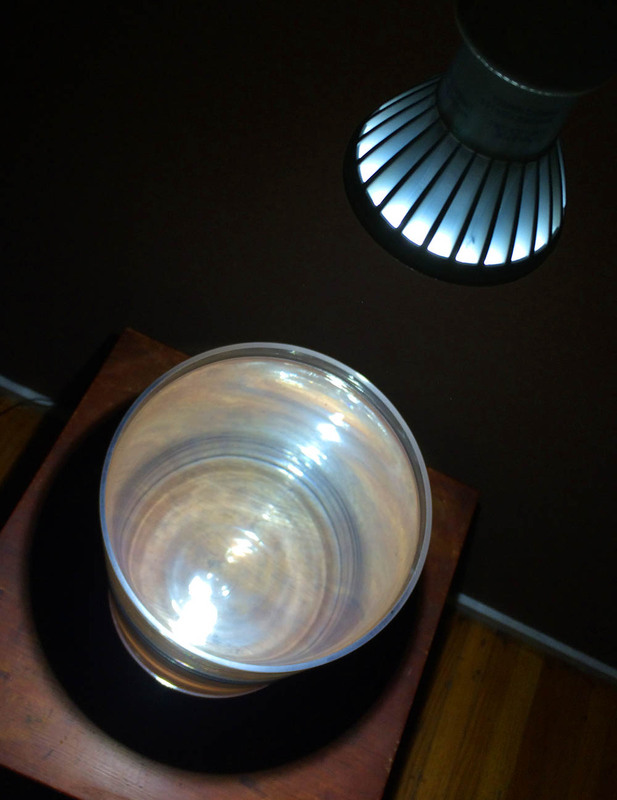 This kind of lamp matches a standard light bulb socket, with the same socket threads as an A-bulb incandescent. The designation “PAR” abbreviates “parabolic anodized reflector” and references the integrated aluminum reflectors of incandescent or halogen lamps manufactured in this style. PAR LEDs do not have internal reflectors; the space inside of the lamp is occupied instead by the diodes, other electronics, and the heat sink. The PAR number indicates the diameter of the lamp at its widest point in eighths of an inch. So, a PAR30 LED is 3.75″ (three inches with six additional eighths of an inch) in diameter. PAR30 is a good versatile size for small planted setups. I’ve used the smaller PAR16 or PAR20 sizes for planted vases of just a gallon or so in volume or where less light intensity is desired. The largest standard size, the PAR38, can provide plenty of light for a larger nano tank or terrarium with a footprint as big as 18″ X 18″. For bright directional lighting, select a “Spot” LED rather than a “Flood” LED. Another advantage of these LED lamps is their low energy consumption. The PAR30 may use only about 20 watts of electricity while providing the brightness of a 100-watt incandescent. Economy of scale with the popularity of these lamps for interior and outdoor lighting has decreased their prices substantially as well. Most should be available for sale at only $15-$20 US. Use PAR LEDs in the 5000K “daylight” color temperature, which should produce a crisp white light approximating the color of sunshine at noon. You will probably find more options on the shelf in “warm daylight” 2600K or 3000K, but these LEDs will provide less photosynthetically useful light and will render colors, especially green, with less fidelity. 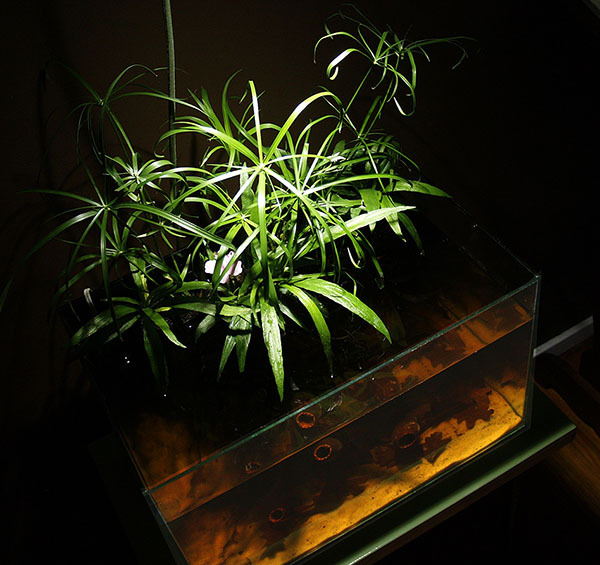 In my experience, warm daylight lamps also seem to encourage algae growth. You will see a full range of greens in living foliage and browns in terrarium leaf litter with light from a 5000K LED. The tea-stained water of a nano blackwater tank looks especially rich under this light. While not really optimized for photosynthesis, 5000K LEDs have grown all kinds of plants very well in my projects. Nano planted tanks, Wabi Kusa bowls, and smaller vivarium ecosystems will enliven your home or office with radiant living foliage, the shimmer of clean water, and enchanting tiny animals. A pendant LED lamp connected with a durable, attractive, cloth-covered wire cord fixture can be the perfect lighting solution for this kind of intimate living display, illuminating the enclosure from within and providing spillover light to harmonize elegantly with the interior space. Endless possibilities in a 4-gallon glass vase ready for planting (illuminated with a PAR20 Pendant LED). Hi Devin! I found this article very useful, thanks for taking the time to write it up. I do a lot of smaller vase/bowl aquariums and vivariums and am always looking for better options to provide lighting, and this was a nice run-down. But what you didn’t mention is how high up these pendant lights should be, and how much that will effect both the spread of the beam and plant growth. Mounting on a wall isn’t always an option for me and often the bulb/hood will have to be fairly close to the top of the viv, and I’m concerned of this will burn the plants nearer to the top or if the angle will be too narrow. Do you have any insights on this? Thanks! Hi Jeremy, Thanks so much for reading! I have used a casual approach to selecting and positioning those lamps and usually hang them 12-24″ above the enclosure. The PAR-base LED spot beam seems to emit very little in the way of heat radiation, so foliage burning is less of a concern. If positioned very close to the plant foliage the LED lighting could drive the plant metabolism too fast, leading to nutrient deficiencies. Most of the plants that I keep are pretty undemanding and will grow well with moderate lighting, so I err on the side of less light intensity and hang the light so that it just illuminates the areas of display more less evenly. If I observe extra algae growth or yellowing foliage, I switch to a smaller PAR lamp or raise it higher. Hi Jeremy, Thanks so much for reading! I have used a casual approach to selecting and positioning those lamps and usually hang them 12-24" above the enclosure. The PAR-base LED spot beam seems to emit very little in the way of heat radiation, so foliage burning is less of a concern. If positioned very close to the plant foliage the LED lighting could drive the plant metabolism too fast, leading to nutrient deficiencies. Most of the plants that I keep are pretty undemanding and will grow well with moderate lighting, so I err on the side of less light intensity and hang the light so that it just illuminates the areas of display more less evenly. If I observe extra algae growth or yellowing foliage, I switch to a smaller PAR lamp or raise it higher. Hi Devin! I found this article very useful, thanks for taking the time to write it up. I do a lot of smaller vase/bowl aquariums and vivariums and am always looking for better options to provide lighting, and this was a nice run-down. But what you didn't mention is how high up these pendant lights should be, and how much that will effect both the spread of the beam and plant growth. Mounting on a wall isn't always an option for me and often the bulb/hood will have to be fairly close to the top of the viv, and I'm concerned of this will burn the plants nearer to the top or if the angle will be too narrow. Do you have any insights on this? Thanks!